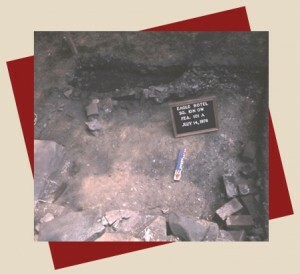 Several locations within Erie County have been sites for archaeological “digs,” both pre-historic and historic, conducted by Mercyhurst College, Edinboro University and Gannon University, including the following two examples. Author: Renata B. Wolynec, Ph. D.
The Battles Farmstead (over 80 acres in area) is a multi-component site consisting of an unknown number of Native American occupations and a historic farm. Since 1988, archaeological research has focused on the area immediately surrounding the most obvious feature of the site, the Yellow House (1857). Behind the house are found the foundations of several farm buildings including a granary, chicken coop, pig lot, and a variety of storage buildings including several outhouses. The property is noteworthy because it was developed by Rush Battles a well known farmer, banker, and industrialist. The locomotives built by his Climax Manufacturing Company were used as far away as Australia. Many of the locomotives were responsible for bringing the lumber which hastened the growth of the city of Pittsburgh. The site has been used as an outdoor archaeology classroom since 1990. Students with a wide variety of abilities, disabilities, and professional interests are able to learn, through experience, the critical thinking processes and skills which are an important part of archaeological field and laboratory work. The Waterford Historical Complex is a multi-component site which includes the remains of French (1753), British (1760), and American (1796) military occupations and two intact historic buildings (the Eagle Hotel (1826) and the Amos Judson House (1826)) associated with the town of Waterford, PA. The French fort known as Fort de la Riviere aux Boeuf was the site of George Washington’s first important mission as an officer. His journal, recounting the events of this very dangerous mission, remains a popular publication in Williamsburg, VA. Since 1975, excavations have focused on the search for the French and British fort remains as well as on the areas surrounding the Eagle Hotel and Judson House. Although few artifacts from the colonial period were found, large areas of wood charcoal in the vicinity of the Judson House suggest the remains of either the French or British forts (both were destroyed by fire). Remains from the American period are much more plentiful, numbering over 160,000 artifacts and garbage remains. Old entrances and a past porch were discovered associated with the Judson House. The remains of a root cellar, ice house, and kitchen were discovered in association with the Eagle Hotel.